FIRST-year A-League coach Mark Rudan has wasted no time getting stuck into the much-loathed video assistant referee. The Wellington boss oversaw a 2-0 to Melbourne City on Friday night, thanks to fine goals from Ritchie De Laet and Bruno Fornaroli either side of half-time. Rudan wasn't too concerned with the performance, saying it was "very early in their development phase," but took issue with the refereeing performance. The Kiwis thought they had a route back into the contest on 66 minutes when Mitch Nichols' shot on goal was blocked by Scott Jamieson's hand for a free-kick. When replays showed the ball to have struck Jamieson inside the box, referee Adam Fielding rushed to the sideline to inspect the decision and Rudan expected a penalty to be awarded. Instead, Fielding used the VAR to reverse his decision, seeing the City skipper's hands were crossed over his chest and signalling for a drop ball - enraging Rudan. "The referee was five metres away. Sees a handball offence. Was very quick to blow," he said. "Everyone saw it ... when they went to the VAR I was super confident it was going to be a pen. "Only for them to turn around and say it wasn't a handball. I don't know what to say. It was a big turning point in the game." 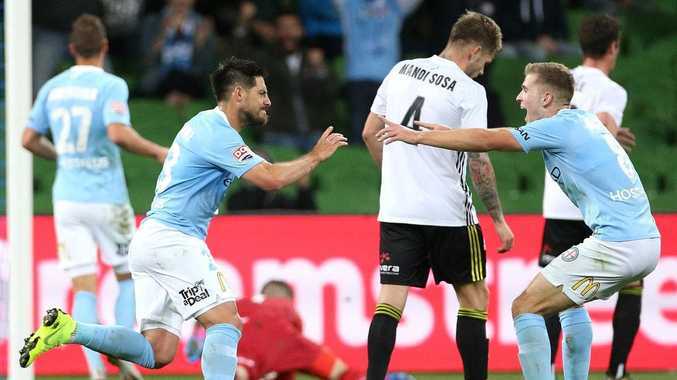 The decision followed the penalty decision from the Melbourne derby, when City also benefited from a VAR review to receive a crucial spot kick. A-League chief Greg O'Rourke criticised that decision and said it was acceptable for referees to change their mind after accessing VAR - as Fielding did on Friday. Rudan said referees needed to explain their decisions. "It never is (explained). I don't think they know themselves," he said. "You can't even talk to the officials, that's the other problem. "I'm trying to communicate (about) certain decisions that go on and I got a yellow card." The Nix have lost two straight games after opening with a win, leading Rudan to call for patience. "Our game plan was to frustrate them," he said. "Say what you want about the game plan but we were very disciplined. "Could we have done better? Yeah we could have, particularly with the ball. "We're very early in our development phase ... at 2-0 it's not like we gave up hope, we kept going."